Your Healing is Killing Me is a performance manifesto based on lessons learned in San Antonio free health clinics and New York acupuncture schools; from the treatments and consejos of curanderas, abortion doctors, Marxist artists, community health workers, and bourgie dermatologists. One artist's reflections on living with post-traumatic stress disorder, ansia, and eczema in the new age of trigger warnings, the master cleanse, and crowd-funded self-care. Capitalism is toxic but the Revolution is not in your body butter. With humor, gravity, and hard-won insight, Virginia Grise delivers the dazzling but bittersweet dispatches of a journey through the rocky landscapes of healthcare and self-care—the folly and wisdom it takes to arrive at the body's best spiritual medicine. Virginia breaks the heart open with the poetic force of this work. Ceremoniously / transgressively she calls out the Truth—the Ancestors know that we are all in need of healing, so they've prayed all that we need inside of our blood and bones. This book is the topography of that. 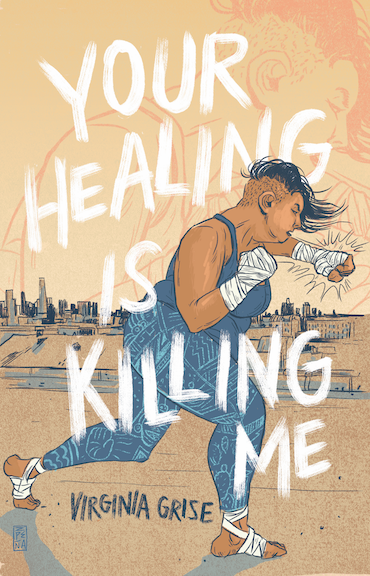 In Your Healing Is Killing Me, Virginia Grise weaves the fabric of her life as an artist with threads from Chairman Mao's 4 Minute Physical Fitness Plan, traditional healing rituals, ancient recipes for the heart and skin, and memories emerging from past suppression—both personal and colonial. This Texicana priestess-poet heals herself and us with these alchemical deconstructions of the pain that comes from picking at the scars of human survival. One remedy: read this book. Just remember to breathe while you do so.